I'm a big-time Disney fan, and Disney Junior has always had some of my favorite programming for young children. 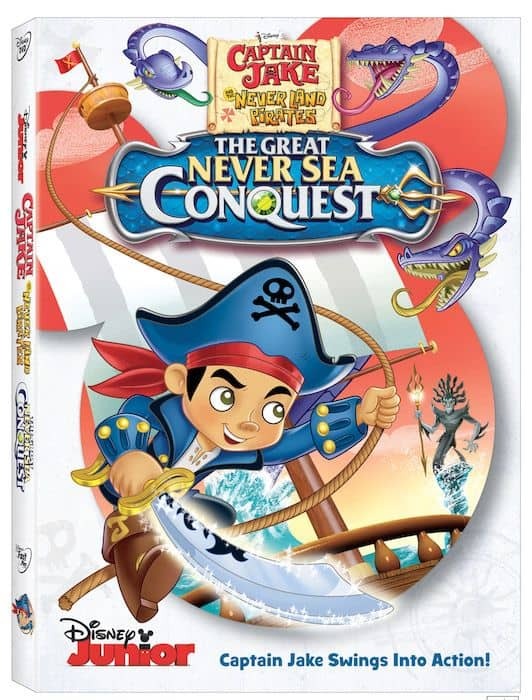 Since my kids like Disney Junior shows as much as I do, everyone was happy when Captain Jake and the Never Land Pirates: The Great Never Sea Conquest was delivered to our home last week! Join newly promoted Captain Jake as he unites Never Land’s all-time greatest pirates! When evil mer-witch Ezmeralda tries to take over the Never Sea by awakening the Strake, a legendary three-headed sea serpent, Jake and his crew try to intervene but encounter Lord Fathom and his sidekick Sinker. Jake forms a team of “Never Land League of Pirate Captains” to battle them all and in the process, outfitted with a magical new sword and a powerful new ship, (the Mighty Colossus), he becomes a Captain himself. Loaded with excitement, additional adventures and a powerful message about believing in yourself, this high-stakes, high-seas adventure is oceans of swashbuckling fun for everyone! Finally, Disney Junior almost always includes a toy or trinket with the DVDs they release. It's a fun little perk that's really exciting for my kids. They're always surprised that there's more than the DVD in the package! Captain Jake and the Never Land Pirates: The Great Never Sea Conquest DVD also includes a free exclusive 3D Colossus puzzle ship that can't be bought anywhere else! The DVD is available now and it has a suggested retail price of $19.99. Right now it's on sale at Amazon for $14.99. That's 25% off the list price, and it ships for free if you have Amazon Prime! Buy Captain Jake and the Never Land Pirates: The Never Sea Conquest today!